Manuel Rodríguez Sánchez, alias "MANOLETE", was born in Cordoba on 4th July 1917. He was the undisputed master of "toreros" and an extraordinary personality in the world of bullfighting. In homage to the creativity of his style, he was dubbed the "Fourth Caliph" and attracted a massive following not only in Spain but also in America. A friend of intellectuals but at the same time simple and down-to-earth, people warmed to his particular style of bullfighting - his solemn look, upright stance and sheer bravura so typical of Cordoba. Today, sixty years after his death, his slim figure, his sober, phlegmatic appearance and his poker-faced, melancholic look, live on in Cordoba as vividly as ever, as if time had stood still. 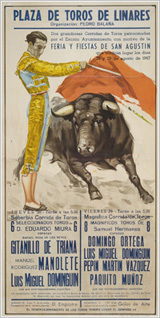 The Manolete Route allows you to take a tour of all the significant places in the life of the bullfighter - his birthplace, where he lived, where he trained - even the taverns he frequented, where nowadays they display so much memorabilia of this Cordoban figure so universally loved and admired.